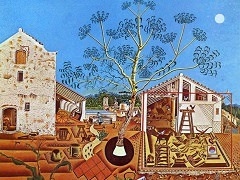 Catalan Peasant in the Moonlight derives its whole being from a wonderfully simple, but nevertheless effective emphasis on colour as its prime element. 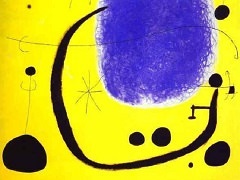 The horizontal division is reminiscent of Miro's Landscapes of the 1920s. Also, his choice of a small number of pure, elementary colours points in that direction. What is new, however, is the artist's use of black as a colour. 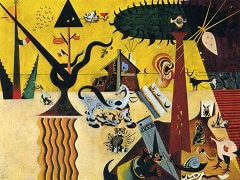 Miro has filled the entire lower part of the painting and also further portions higher up with black. 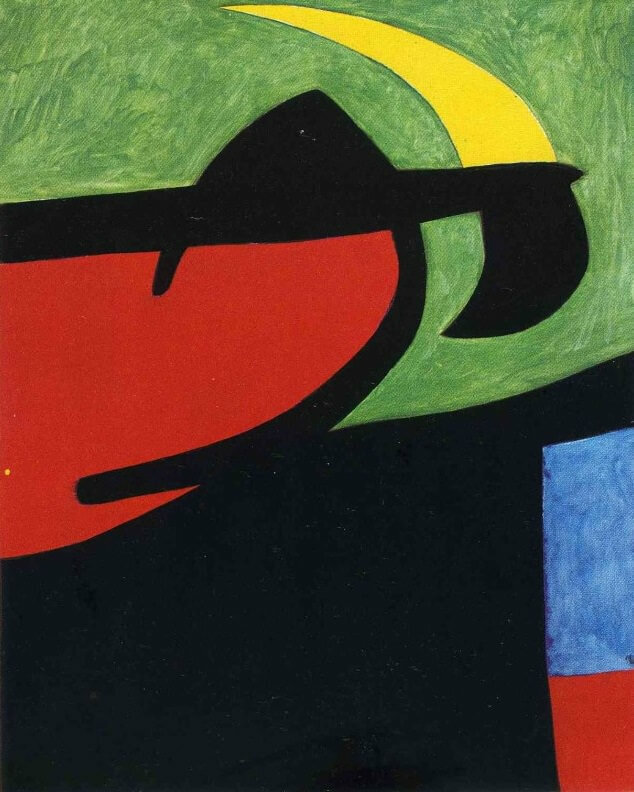 The black area at the bottom is counter-balanced by the light green at the top, which, in turn, forms a complementary contrast with the red shape that thrusts itself into the picture from the left. The yellow moon-like crescent also has a black bottom portion. The black area at the bottom of the painting includes a strong colourful contrast in the form of two rectangles on top of one another. 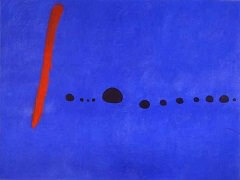 Red and blue as a contrastive pair are among the most powerful colour polarities that one can perceive. They unite the most intensive hot-and-cold tensions as well as effects of light and darkness and the impression of being flooded by simultaneous optical phenomena. 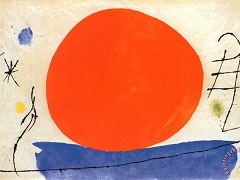 It is from these colourful insertions alone that the entire composition derives its tension: the cheerful blue, which is of a similar hue to the green, forms a harmonious relationship with the yellow, and the red quadrilateral corresponds to the red shape in the middle left corner and lends a certain warmth to the large black area. Rather than diminishing the strength of each colour, the sharp contrast between black and bright colours brings out the true glow of these colours and emphasizes their intensiveness. 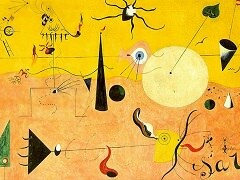 Miro's title serves to underline the poetic abundance of this rich composition of colours.